In the end of the 5th century B.C., “The Lugano Painter,” or “Il Pittore di Lugano,” worked on many pieces that archaeologists have unearthed and attributed to him. This “calyx krater,” or urn, shows a bearded Dionysus with his thyrsus (staff topped with a pine cone), a bacchante (female follower of Dionysus (a.k.a., Bacchus) playing a drum, and a satyr playing a double flute. 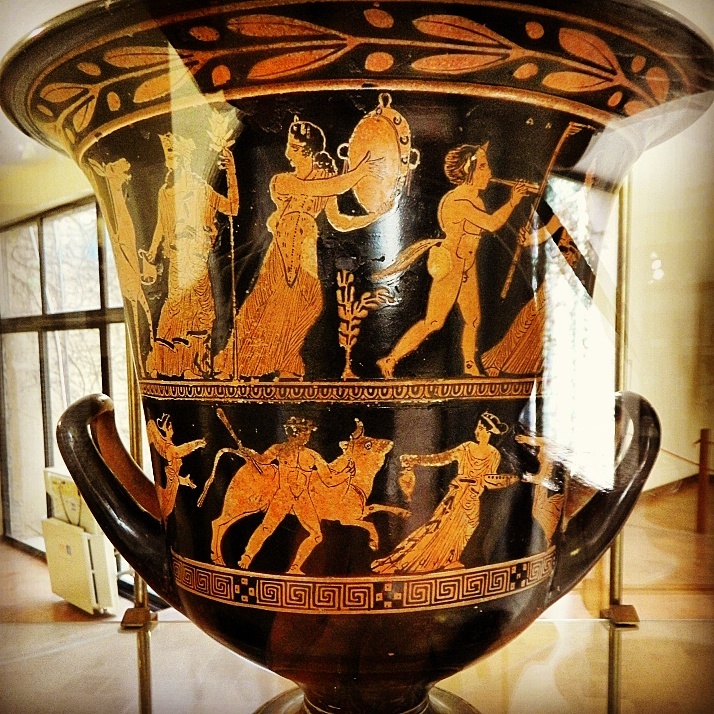 Because the primary use of kraters in Ancient Greece was to mix wine with water, scenes on them often depict the carefree life of those who followed Dionysian rituals, which included drinking wine, playing musical instruments, dancing, and enjoying orgiastic activities. The amount of water to wine would be determined by the type of event for which the wine was being served. For example, if it was a for a symposium or discussion, more water to wine would be used. If it was for a looser type of revelry, then less water would be used. That is a stunning work of art. Oh, and less water for me! On Dionysus! I like the concept for sure… sometimes I want less, sometimes I want more!